Edna King is a former teacher and preschool director. She earned a Bachelors in Education and a Masters in Early Childhood Education. She and her husband Mark are parishioners at Saint Elias in Decatur, Georgia. Mark directs the choir and Edna assists in the church Bookstore. Mark and Edna have four children. Edna’s oldest child is an adult, her youngest child is in heaven after a lengthy battle with cancer, and her middle children are adopted boys from Ukraine. Edna is one of the authors of Woven, a book for teen girls, as well as articles for Engage Orthodoxy and the Sounding Blog on OCN. As a writer and member of the Engage Orthodoxy team, she brings a unique perspective on parenting and draws upon her varied life experiences, 17 years of teaching, and the Orthodox faith to help other parents with their challenges. Father Paul Kaplanis graduated from Western Connecticut State University in 1979, with a B.S. Degree in Social Science and History. In September 1979, he entered Holy Cross Greek Orthodox School of Theology. On June 27, 1982, Father Paul and Presbytera Evi (Spiliopoulou) Kaplanis were married at the Dormition Greek Orthodox Church in Danbury. In 1983, he graduated with his Master’s of Divinity Degree and upon receiving the Taylor Scholarship, Father Paul enrolled in the Master’s Program at the University of Thessaloniki, Greece. After one year, he returned to the U.S and was ordained by His Grace Bishop Philip to the Holy Diaconate at his hometown parish on October 28, 1984 and to the Holy Priesthood on November 11, 1984. Father Paul was bestowed with the Offikia, (office) of father confessor and stavroforos by Bishop Philip and on September 2002, His Eminence Metropolitan Alexios bestowed upon Father the Offikion of Protopresbyter. 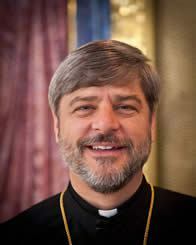 Father Paul is the Dean of the Greek Orthodox Cathedral of the Annunciation in Atlanta, Georgia. Regina is a student at the University of Georgia working toward a B.S. and a B.A. in physical and human Geography, respectively. She attends Saint Philothea Orthodox Church in Athens, Georgia where she also teaches Sunday school and chairs a committee to improve the sustainability of the church. Additionally, Regina serves as Vice President of the Orthodox Christian Fellowship at UGA. When she is not studying the effects of human behavior on the environment, she enjoys reading, writing, visiting the Georgia Botanical Gardens, and making tea. Regina is passionate about engaging with fellow Orthodox college students and learning about how to live in the fullness of the faith as a young woman in the 21st century. Khouria Faith Potter received her MA in Clinical Mental Health Counseling from Richmont Graduate University in Atlanta, GA. She lives in South Glens Falls, NY, where her husband, Fr. Gregory, is the priest of St. George Antiochian Orthodox Church. She has a background in International Affairs and non-profit work and did her clinical work for her counseling degree at a women and children’s homeless shelter, where she specialized in grief counseling and DBT. In her spare time, Faith enjoys knitting, tending to plants, and singing shape-note music. Jacob Sparks is an undergraduate at the University of Georgia studying theology and math. He is the current president of UGA's Orthodox Christian Fellowship chapter and is passionate about living an Orthodox life and encouraging others to do the same. In his spare time he can be found practicing card tricks, reading the scriptures and church fathers, or having outrageous discussions about politics and philosophy with his friends. Isabelle Ryerson is a college student and recent convert to Orthodoxy. An Indiana native, currently, she is working toward a degree in Communication with a concentration in Public Relations and a minor in Political Science from Berry College, located in Georgia. She is a member of St. Basil the Great Orthodox Mission in Marietta, Georgia. In addition to writing for Engage Orthodoxy, she is also the chair of the social media committee for the Connect Orthodox Young Adult Conference. When not in classes or at work, she enjoys reading, baking, knitting and delving deeper into the Orthodox Faith.